There’s no denying that the technological revolution has changed the way we as a society communicate. It’s now possible to get a message in more than one possible ways. It’s a connected world now where computers and Internet have become the indispensable part of our lives. With the proliferation of the internet, now more than ever, individuals and businesses have started realizing the significance of being able to stay connected. In fact, every aspect of our very existence can be influenced by the Web. However, the internet may be as exciting as it gets, it lacks regulation and it’s often full unpleasant surprises. Everyone connected to the internet is vulnerable to online attack every day, and they need to take necessary security measures to stay protected. This is where antivirus programs come to the picture. Computer security is essential and it’s always recommended to install antivirus software on your system to stay protected at all times. And when it comes to computer security, Kaspersky and Norton are the two most reliable antivirus programs that provide complete security solutions to individuals and businesses alike. Let’s see how the two stack up against each other in terms of protection, system impact, cost, resource use and more. Norton is the antivirus suite of internet security, enterprise security and total security solution sold under the ownership of Symantec Corporation. Norton Antivirus is the flagship product of Symantec which contributes significantly to the company’s claim to fame. Symantec was founded by Gary Hendrix in 1982 as a grant from the National Science Foundation (NSF) and was incorporated in 1988. When the company was initially founded, it was largely focused on artificial-intelligence but over time, it became a global cyber security firm specialized in providing security and information management solutions to small and medium enterprises and government organizations. Norton now offers a sizable software suite of antivirus packages and security solutions to protect all your devices. It is the world’s largest family of antivirus suites and computer security products developed by Symantec Corporation and sold under the name Norton Antivirus. Kaspersky Lab is a premier cybersecurity and antivirus provider that provides award-winning security software and extra tools and utilities for individuals and businesses around the world. It is a global cybersecurity company based out of Moscow, Russia and operated by a UK based holding company. The story of Kaspersky Lab began in 1989 when a young fellow named Eugene Kaspersky detected a virus on his desktop computer and successfully managed to protect his computer. He became fascinated with viruses and malware since then. Later, Kaspersky joined a company named KAMI while Natalya, Eugene’s then-wife, joined the team as a sales manager to handle sales channels. In 1997, Natalya persuaded Eugene to leave KAMI and start their own company. In 1999, Kaspersky Lab opened its first sales office abroad. It is now one the largest antivirus software vendors in the world. – Norton is the software suite of antivirus packages and cybersecurity products developed by California-based Symantec Corporation and sold under the name Norton Antivirus. Symantec is a global cyber security company specialized in providing security and information management solutions to small and medium enterprises and government organizations. Kaspersky Lab is a premier cybersecurity and antivirus provider based out of Moscow, Russia that provides award-winning security software and extra tools and utilities for individuals and business, mostly small and medium enterprises. Kaspersky is one of the largest antivirus and security software vendors in the world. – Both Kaspersky and Norton offer a wide range of antivirus packages to address the needs of all types of users, starting from basic home-use packages to business-focused products aimed at small to medium businesses. The basic plan offered by Norton costs $39.99/year which covers all the basic features utilities for home users, while the Kaspersky’s entry-level product starts at $39.95/year/device, which is almost the same. Norton business plans start at $99.99/year for 5 devices and go all the way up to $249.99 for up to 20 devices support. The prices remain consistent with the high-end plans for business users. – While Norton offers some of the best protection rates around while providing the best malware protection possible, Kaspersky does a fairly exceptional job protecting against phishing attacks. Norton seems to slow down during regular scans, especially if you have an old system and scanning takes a lot of time, compared to Kaspersky, which almost takes half the time when running the same thing on Norton. Norton is best suited for enterprise-level security providing high-end security to large business enterprises, while Kaspersky is focused on small to medium enterprise businesses. – It is very important for a security product to consume as low system resources as possible to not affect the system performance in any way. While both Kaspersky and Norton are lightweight antivirus programs that consume less system resources without affecting the system performance, Kaspersky is a little ahead of the game in this regard. Norton, on the other hand, relatively puts less impact on system performance in terms of resource us, especially during regular scans. But it’s almost impossible to judge a product’s reliability based on just one factor. While both Kaspersky and Norton are among the most popular and reliable antivirus software programs around, providing all-around security to individuals and businesses alike, Norton is quite better at malware protection than Kaspersky, which on the other hand, provides total security against phishing attacks. Norton lags a bit though, when it comes to scan times but considering its budget-friendly price against its comprehensive protection plans, it’s worth the deal. Besides, both provide a wide range of antivirus suites and security products to suit your basic needs. Sagar Khillar. 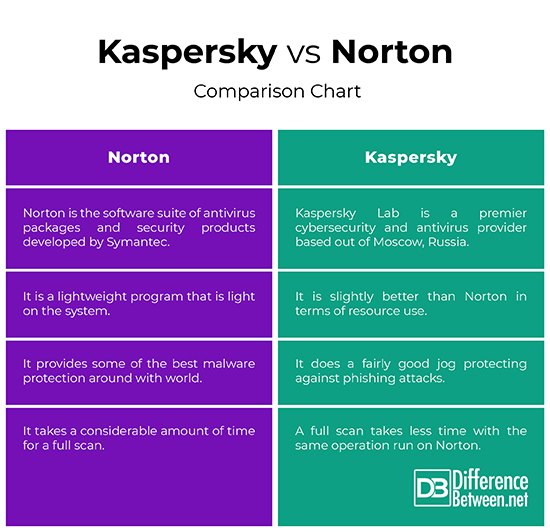 "Difference Between Kaspersky and Norton." DifferenceBetween.net. April 4, 2019 < http://www.differencebetween.net/technology/difference-between-kaspersky-and-norton/ >.